Taste the best of this famous foodie city! 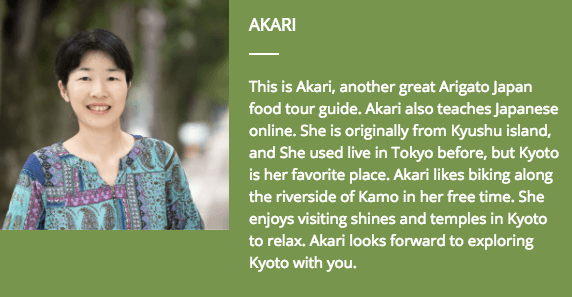 One of our expert Kyoto guides, Akari, loves to share the delicious traditional foods famous in Kyoto- In this post she shares her top 5 must-try recommendations. My favorite place in Kyoto is along the riverside of Kamo-river. It is so nice to bike along the river, take a break and sit down and listen the sound of water. When you rest along the riverside, you might notice how the water is pure. The Kyoto area has a lot of pure, underground, spring water. This clean, clear water is does not have a lot of hard minerals and tastes pure and mild. Because of this water quality, Kyoto’s tofu, tea, sake, and many other foods are so delicious. Today I’d like to introduce you to 5 famous Kyoto foods. Tofu has become a universal food nowadays. 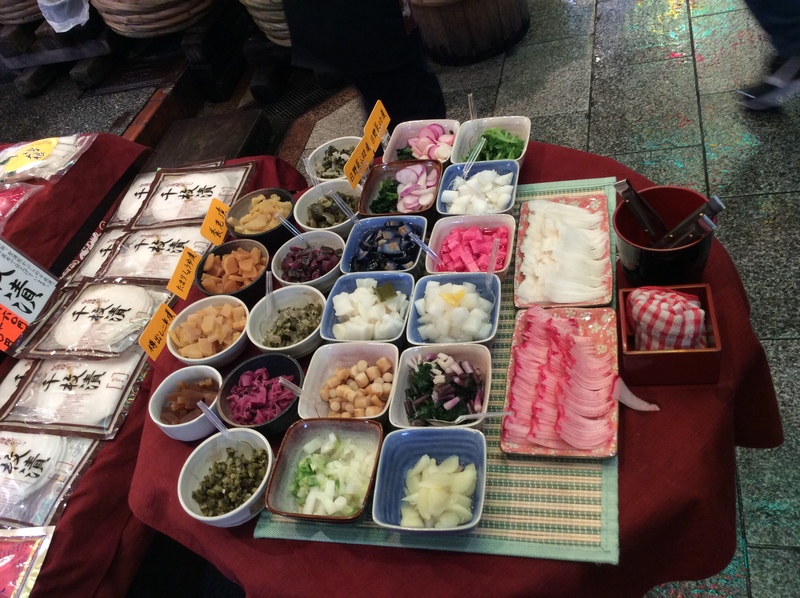 But still when you come to Kyoto, you’ll be surprised how Kyoto’s tofu is mild and delicious. Tofu came to Japan from China in the 8th century. Later, in the 13th century, the Buddhist prohibition on meat-eating gave rise to vegetarian cooking, and tofu became an essential ingredient for health. Monks considered tofu their primary source of protein and invented many delicious tofu dishes. 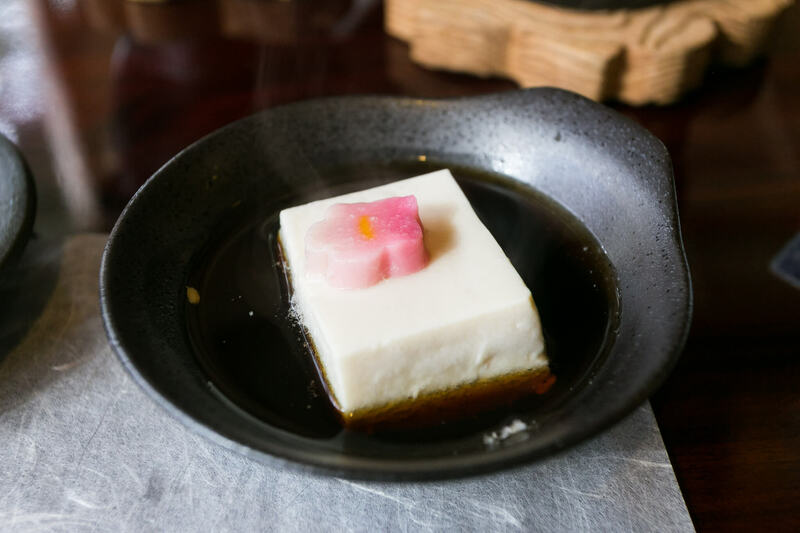 The two basic types of tofu are: momen-dofu, which has a richer flavour, and kinugoshi-dofu, which has a finer texture. “Okara” is tofu lees, “Atsuage” is deep-fried tofu. We also have sesame tofu, peanut tofu and so on. Kyoto pickles (Tsukemono) Tsukemono are a part of the basic Japanese diet. Japanese pickles often use rice bran and keep the original flavor of the vegetables. Radish, cucumber, eggplant, turnip… we use many vegetables for tsukemono. They are often flavored with spices, herbs, and stock from fish and kelp. 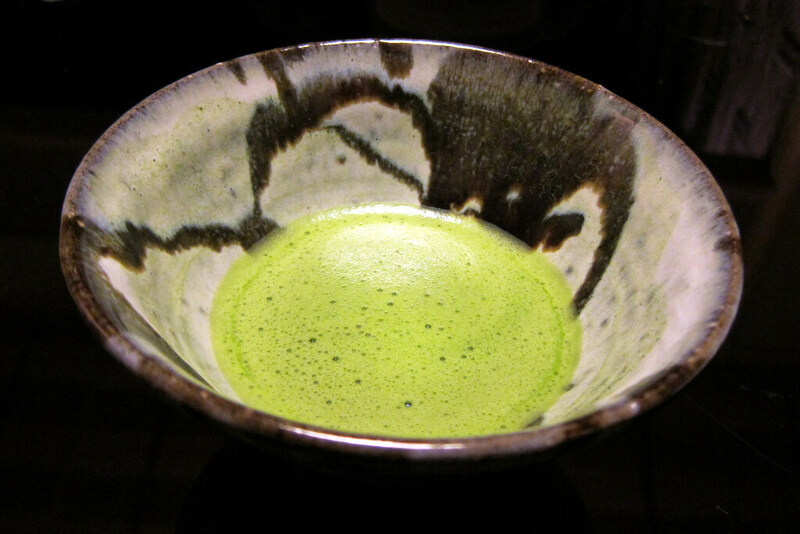 Kyoto is known for very good quality Matcha (a specialized powdered green tea). It is believed that the first green tea was brought to Japan from China by the Zen Monk Eisai in 1191 AD. The tea was planted on the temple grounds in Kyoto. Matcha, green tea powder is made from the dried leaves of the tea plant. Unlike other types of teas, the green tea powder is not strained out before drinking, so you are consuming the entire leaf, and it’s good for your health. The Uji area south of Kyoto city is famous for their Green tea. There’s lots of famous tea houses which serve Matcha and Wagashi (Japanese confections) there. Wagashi, Traditional Japanese confections, go well with Macha. Common ingredients are rice and other starches, namafu, sweet red bean, roasted soybean powder, and green tea powder. Traditional confections are almost always made by hand. With a delicate touch, the ingredients are fashioned into exquisite representations of nature’s seasonal beauty. In ancient times, very few sweet things were available in Japan, so nuts and fruits were highly prized. Around the 8th century, simple confections were brought into Japan from China. Their ingredients were rice and flour, and they were deep-fried. In the 16th century, European trading ships arrived, bringing confections using a lot of sugar. Confections using sugar were widely considered luxuries, and in the middle of the Edo period they became very popular. 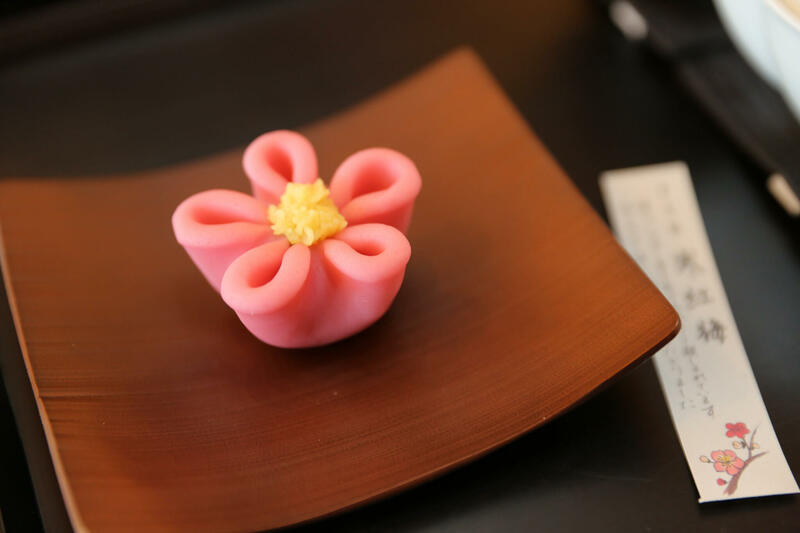 As time went by, the wagashi were connected to the tea ceremony in traditional aristocratic culture and the various annual events gradually transformed wagashi into beautiful confections that can truly be described as “edible art”. The primary ingredient of sake is rice. Since the earliest times, life in Japan has revolved around agriculture, and Japanese culture developed alongside rice cultivation. Kyoto’s Fushimi ward, which is home to many sake breweries, is one of a number of locations throughout the country which are known for their sake. The underground spring water of Fushimi, specifically the balance of elements like potassium and calcium in the medium-hard water is of the perfect quality and composition for making sake. 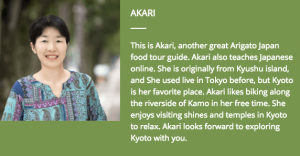 Arigato Japan offers several different Kyoto food tours. On the “Gion Kyoto Night Food Tour”, and the “Kyoto Pontocho Walking Food Tour” you can enjoy beautiful night views of Kyoto, and try delicious food. On our “Kyoto Market Tour”, you’ll find all the foods I wrote here as you explore the famous Nishiki market. 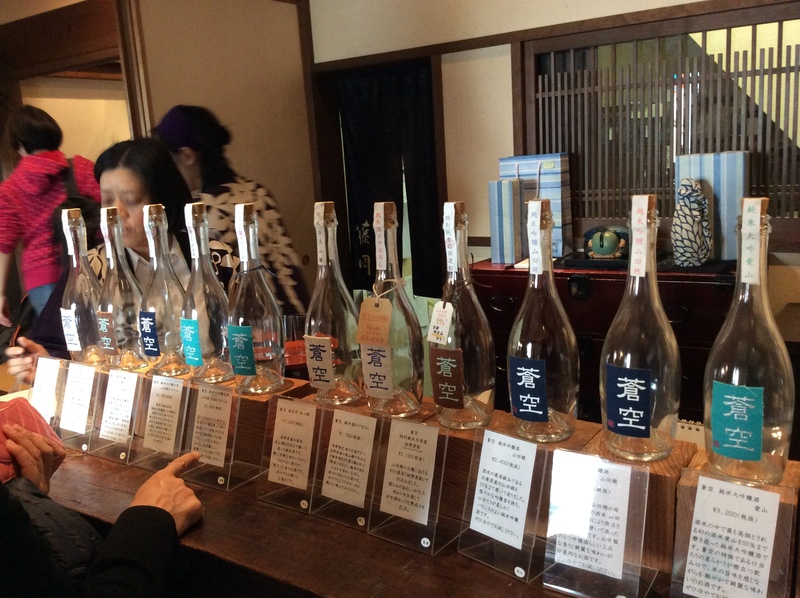 On the “Kyoto Sake Brewery Tour”, you can visit a sake museum, taste local sake, and enjoy scenery of the area. I hope you’ll enjoy Kyoto foods! How to talk about Kyoto in One-minite English, 2nd, Kadokawa, Japan, 2016 by Hirose, Naoko.